Product Description: Acuvim72 is a newly designed and compact 3-phase power meter. 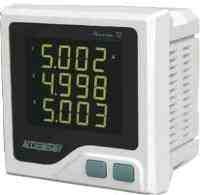 It can measure voltage and current parameters. The RS-485 communication interface and Modbus-RTU are supported, and Acuvim72 is mounted with a large, high clarity LCD screen. Measuring 3-phase voltage, 3-phase current and frequency. Input directly from voltage or current transformer, PT/CT ratio can be set.